Geoff Johns and Ivan Reis raise the dead in the most anticipated comics story of the year! Throughout the decades, death has plagued the DC Universe and taken the lives of heroes and villains alike. But to what end? 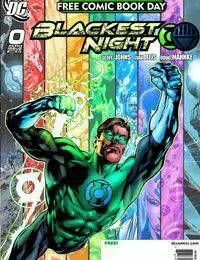 As the War of Light rages on, the prophecy of the Blackest Night descends upon us, with Hal Jordan and the Green Lantern Corps at the center of it all. Dont miss this 8-issue epic taking the DCU beyond the grave!